Irena Knezevic, Various Instances of a Negligible Mistake: Garden 2, 2011, color photograph, 22 x 29 1/2”. Could democracy be the cause of all the world’s misery? This is one of many provocative questions posed by Irena Knezevic’s “Here Comes the Darkness,” an unsettling, profoundly relevant exhibition whose metaphorical center is a thirty-two-minute video from which the show’s title derives. The video intercuts shots of far-flung locales—the Zagros Mountains bordering Iraq and Jordan, an apple orchard, the scenery from Hitler’s nature walks just outside Munich—with animated images of spinning stars and scenes of dancers performing movements choreographed by the artist. A slow-building tension is created in the work by the often joltingly discordant sound track: for instance, when a shot of dead fish is paired with an a capella version of Van Halen’s “Runnin’ with the Devil,” and when—in the video’s most chilling sequence—footage of an off-air television news station is paired with the terrified voices of American and British soldiers trapped by mortar fire. The show’s sculptural and photographic works repeatedly reference the Labyrinth of Greek myth. In a mixed-media sculpture titled Infinity, the Answer to All Questions, 2011, one such maze is etched into a vinyl record’s grooves, just as it has been psychologically embedded into the brains of the traumatized Balkan War victims who are the subjects of the photographic series “Various Instances of a Negligible Mistake,” 2010–11. 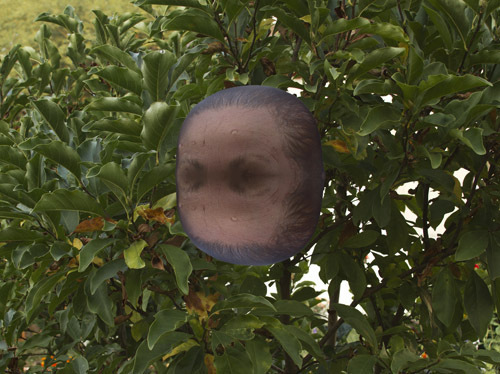 Knezevic has digitally altered their images so that each person appears only as a floating ball of hair and flesh. So profuse are the Serbian artist’s references to catastrophe—from Third Reich atrocities and the war on terror to modernism’s failed social and aesthetic utopias—that she risks affects akin to political melancholia. Yet glimmers of hope remain. At the exhibition’s center stands Minotaur, 2011, a huge black rectangle formed from suspended strands of audiotape. An electrostatic machine placed at the top of the structure emits blue sparks relative to the movement of bodies gathered inside—the more people, the more static generated. Perhaps therein lies our only way out.